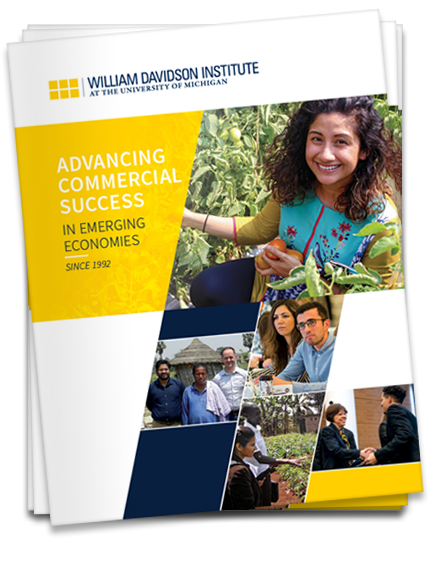 "To equip economic decision-makers in... emerging countries with the tools of commercial success." We analyzed more than 30 renewable energy enterprises in India, helping them and their investors grow the clean energy industry. We helped launch an online payment system in a teaching hospital in Ghana—giving patients an easier option to settle their bills. We have connected over 700 University of Michigan graduate students with internship opportunities in emerging markets—empowering new and rewarding career paths. We helped build monitoring, evaluation and learning tools at three social enterprises in Latin America—enabling them to tackle key business challenges. We connected over 500 University of Michigan and Middle Eastern and North African (MENA) students to develop business solutions to address social challenges. Located at the University of Michigan, we are an independent, non-profit research and educational organization guided by our founding principle that thriving businesses drive economic development and improve social welfare in low- and middle-income countries. With deep expertise across multiple industry sectors and disciplines, we partner with profit-seeking firms and nonprofits to develop and apply proven business practices. Harnessing the latest innovations in education, we provide world-class management training opportunities for the global leaders of today and tomorrow.